Rasam is a delicious pungent and spicy, South Indian soup that uses tamarind as a base, with the addition oftomato, chili,pepper,cuminand other spices as seasonings. The tangy flavours of tamarind mixed with thepepperandotherspices make a taste explosion in your mouth. The Indian equivalent of the Jewish Chicken Soup!Every South Indian family has its own recipe - this is ours - we hope you enjoy it. 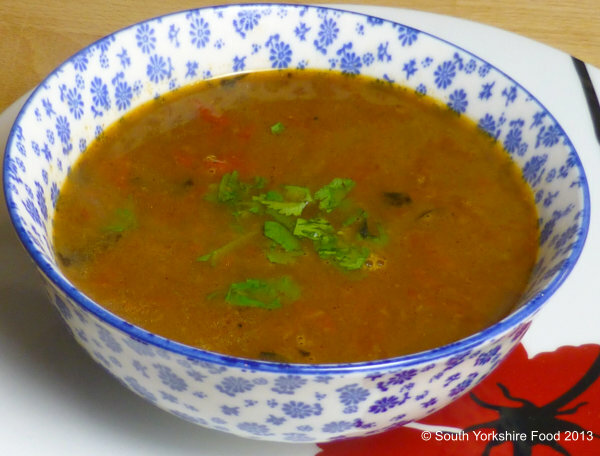 Rasam can be used as a side dish,alongsidethe rice, with your favourite curry.Serves 3-4. Dissolve the tamarind paste in the hot stock. Place tomatoes in a bowl, and mash the tomatoes into a coarse pulp. Place the tamarind stock, crushed garlic, and tomatoes in a saucepan, bring to a boil and simmer for 1 minute. While it is cooking, heat oil in another saucepan and add the chili, curry leaves, mustard seeds, urad dahl and asafoetida. Stir till fragrant and the mustard seeds pop. Now add in the rasam masala. Stir fry for a further 15 seconds. Add tamarind tomato water, salt, and finally the hot water. Bring it back to a boil, and simmer for 10 minutes. If you want a clear rasam, you can strain it at this point, but straining is optional. Garnish with the coriander leaves and serve with steamed rice or in cups, as soup.